Provide comfort for the family of Jeanette Cardello with a meaningful gesture of sympathy. 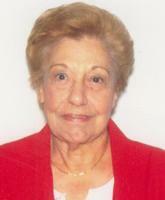 JEANETTE CARDELLO, 90, of Jackson Twp., NJ, passed away on Monday, February 4, 2019, at Willow Springs Nursing Home, Brick Twp., NJ. She was born in Brooklyn, NY, and resided there until settling in Jackson Twp., 5 years ago. Jeanette was employed in sales with S & D Clothing, Brooklyn, NY, prior to her retirement. She is survived by her son, Donald Bansley of Beach Lake, PA.; her daughter, Linda Rodaligo of Jackson Twp., NJ, her 4 grandchildren, and by her 1 great grandchild. Cremation is private and under the direction of the GEORGE S. HASSLER FUNERAL HOME, 980 Bennetts Mills Rd., Jackson Twp., NJ. For further information and to send condolence messages to the family, please select a tab on the left. Consider providing a gift of comfort for the family of Jeanette Cardello by sending flowers. Provide comfort for the family of Jeanette Cardello by sending flowers.